Fruit flies are pesky creatures that have the unique ability to quickly multiply. While it has been said, throughout history, that these insects have the ability to multiply through the act of spontaneous generation, this is not the case. These insects are simply designed to locate fruits that are fermenting. Once found, they will flock to the fruit and rapidly reproduce. These insects are so small in size that they have the capability of invading structures through screens within windows and even small crevices located around windows and doors. Once they enter into a structure, locate the fermenting fruit, and start the act of reproducing, it is not long before an immense infestation takes over the area. 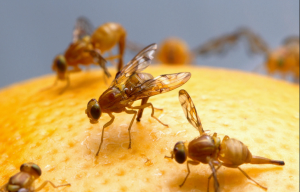 In this guide, you will learn about fruit flies and how to eliminate these troublesome pests. Fruit flies, as mentioned previously, are extremely small insects. The adults typically measure no larger than 4 mm in length. Many have eyes that are red in color; however, there are many adult fruit flies that possess very dark eyes. The thorax of the insect is typically tan in color. The abdomen of the fruit fly is black on the top region and a gray color on the bottom region. When you view fruit flies, you will find that most appear to be a brown or a tan color, overall. When researching fruit flies, you will find that there are many different species, worldwide. These insects originate as eggs and transition into larval. Immediately thereafter, they go into a pupal stage. All of the stages that a fruit fly experiences early in their life take place in just under a week. Once this time has passed, most become adults. In this time period, they feed on fermented fruits and reproduce. Most adult fruit flies only live approximately one month, or 30 days. Interestingly, the fruit fly possesses only four different pairs of chromosomes. Three of them are considered to be autosomal and one determines the insects’ gender. In the year of 1998, the entire chromosomal structure of the fruit fly was officially sequenced by researchers.